Firefighters in Paris confirmed at 9.30 this morning that the fire at Notre Dame cathedral was extinguished. They also confirmed that the "structure of the cathedral, with its two towers, had been safeguarded". Emotions were high last night when the spire collapsed. It has since been established that the vault at the centre of the nave had also caved in when the 91m-high spire collapsed. But the rest of the vault has survived. The first signs of smoke appeared around 7pm last night, and within a matter of minutes, huge flames engulfed the scaffolding surrounding the delicate stone spire, which was in the process of being restored. Some of the 400 firefighters battling the blaze suffered smoke inhalation and one has been seriously injured, but otherwise there were no other victims. The crowd was rapidly evacuated by police, whose headquarters is located opposite the cathedral. A criminal investigation has been launched into "unintentional destruction". The cause of the fire has yet to be confirmed but the focus is on the restoration works. A similar catastrophe occurred in 1997 at the French Monuments' Museum in the Palais de Chaillot, while work was being done under the roof. The wooden roof structure of Notre Dame that was destroyed dated from the 13th century, and was one of the oldest in France. The massive intertwining beams, some bearing inscriptions from the Middle Ages, were so dense that the structure was nicknamed the "forest". The roof was covered with almost 250 tons of lead, which melted and helped spread the fire. However, the medieval stain glass of the apse and the magnificent rose windows have reportedly been preserved. The cathedral's spire was erected in the 1860s when the cathedral was dramatically reshaped by the architect Eugène-Emmanuel Viollet le Duc, an advocate of the neo-Gothic style. Most of the statues date from this period. An assessment is already under way to evaluate the damage to Notre Dame’s artworks. Firefighters evacuated the cathedral’s treasures, which were exhibited in a gallery next to the edifice. They included the cathedral's most important relics, the crown of thorns believed to have been worn by Jesus Christ, which was given to Louis IX in 1238, and the tunic of Louis IX (known as Saint Louis), the most revered French king and the only one to have been canonised. The firefighters were also able to remove small paintings by the Le Nains brothers and other artists of the 17th or 18th centuries, although bigger pieces could not be taken out. The cathedral still holds a dozen Mays: monumental scenes of the life of the Apostles that were commissioned from great artists of May by the goldsmiths' guild each month over the 17th century. Those that still hung in the cathedral are signed Charles Le Brun (Louis XIV's "first painter"), Laurent de la Hyre, Sébastien Bourdon and Gabriel Blanchard. In such situations, it is not the fire or even the smoke that does most of the damage to paintings, but the torrent of water from the firefighters. The cathedral is owned by the state and some heritage associations have already started to denounce the lamentable state of the churches managed by the city. President Emmanuel Macron promised last night that "the cathedral will be rebuilt" and all political events have been cancelled. 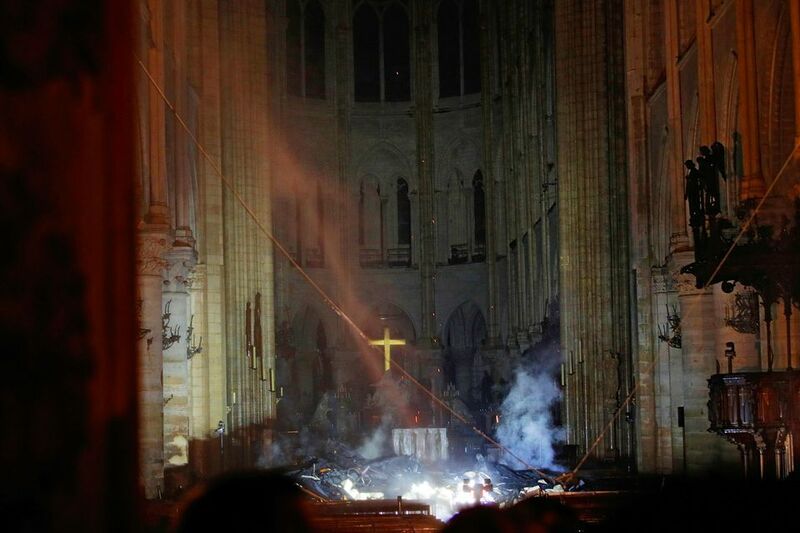 A fund has been opened to receive donations, with the Pinault family, owners of French luxury group Kering, the first to announce it will give €100m to rebuild the cathedral. Bernard Arnault followed with a pledge from LVMH to double this sum, while the city of Paris promised €50m. Russia’s culture ministry will be proposing that museums and citizens raise funds for the restoration of Notre Dame, Vladislav Kononov, a ministry official, told the Interfax news agency today. “We will propose that museums and all concerned citizens organise the collection of funds for the restoration and reconstruction of Notre Dame of Paris. I think this would be appropriate. We will hold consultations with our museum institutions and I think they will support such an initiative," he said. The shock was all the greater because—exceptionally, for such a site—there has never been a fire there since its construction in the 12th century. Like the Louvre, the Eiffel tower or Versailles, it is one of the symbols of France, celebrated in Victor Hugo’s novel The Hunchback of Notre-Dame, which, incidentally, describes flames in the cathedral. "On the crest of the highest gallery, higher than the central rose window, there was a great flame rising between the two towers with whirlwinds of sparks, a vast, disordered, and furious flame, a tongue of which was borne into the smoke by the wind, from time to time," the author wrote. The Catholic writer Paul Claudel had his epiphany there. This is where Napoleon was crowned, where Paris's liberation was celebrated in 1944 and where De Gaulle's funeral was held. It was visited by more than 12 million people each year. Like all churches in France, entry is free. Reconstruction could take decades and cost billions. It took one year to set up the scaffolding around the spire alone. And the budget for the restoration work, that may have caused the catastrophe, was €150m.